Facebook has recently been a lot more focused on user-security and protecting its users’ accounts. Not that it was taking it easy on the security front earlier, but ever since the Cambridge Analytica scandal, the company has pushed even harder for user-security, and privacy. 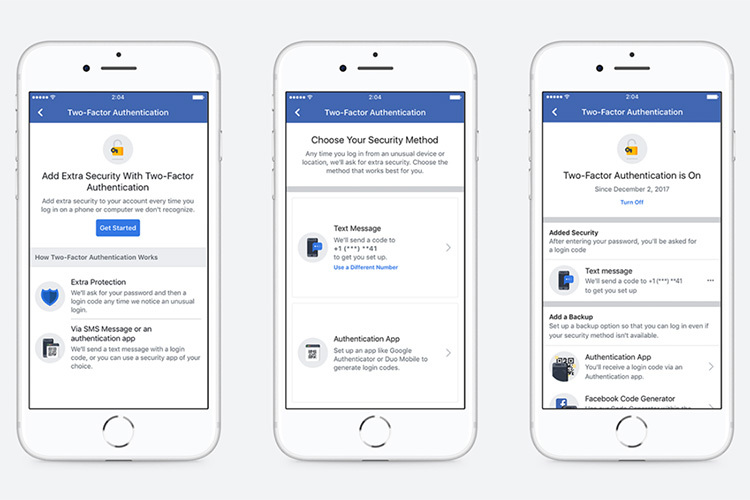 Now, the company has redesigned how two-factor authentication works on its platform to get more users to start using 2FA on the Facebook website, the company has now completely redesigned the process, allowing users to use the added security measure without having to register their phone number with Facebook — something that a lot of people are (naturally) hesitant towards. With the new changes, users will be able to use third-party authenticator apps such as Google Authenticator to set-up two-factor authentication on Facebook. First, the process of setting up two-factor authentication on accounts has been streamlined, with a proper step-by-step flow that is explanatory enough for users to easily understand what two-factor authentication is and how it’ll help them keep their account safe from unauthorized logins. Second, as has been mentioned earlier, the company will now let users use authenticator apps to allow them to set-up 2FA without having to register their phone number with Facebook. Two-factor authentication, for those who aren’t aware, is basically a second-layer of protection on your Facebook account. If you’ve set-up 2FA on your Facebook account, the company will send you a special login code (just like an OTP) every time you log in to your account from a new or unrecognized device, or when you log in through incognito mode. This ensures that even if someone is able to successfully guess your password, they’ll still need the OTP sent by Facebook to your mobile number (or now on the Google Authenticator app) to log in to your account. Personally, I suggest people turn-in 2FA on every service that supports it. I use it on my Facebook account, my iCloud account, and on Google. 2FA is a really great protection against most hacking attempts. Plus, now that you don’t need to register your phone number with Facebook for 2FA, I’d suggest you enable it right now.